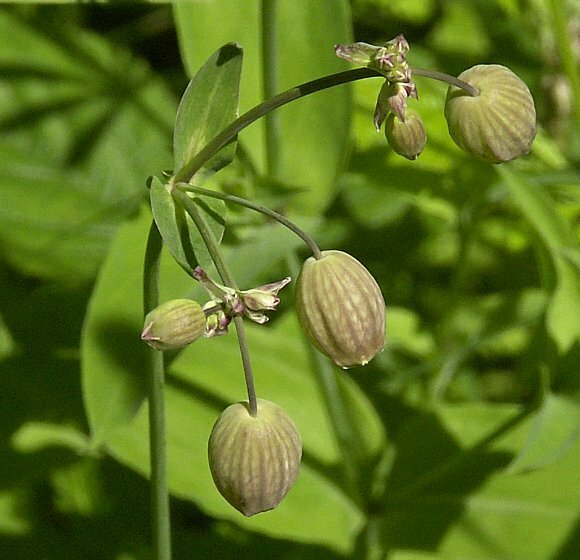 Hybridizes with : Sea Campion to produce a hybrid which lacks a common name, but the scientific name is Silene uniflora × vulgaris. The above examples are un-likey to be this hybrid since that is thinly scattered across the UK in places far removed from where the photos were take. Easily confused with : Sea Campion which some experts and books think are one and the same thing. But Bladder Campion is more branched and stands more erect. But the most notable feature is that the five white petals are so deeply cleft that they look like ten petals, whereas with Sea Campion the petals are hardly notched and much closer together that there is often no gaps between the petals. 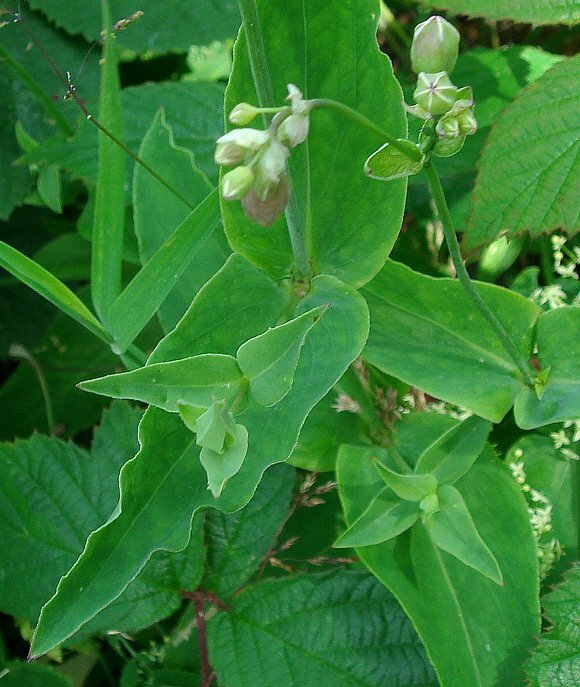 The leaves of Bladder Campion are also much wider than those of Sea Campion. Distinguishing Feature : The five petals are so deeply cleft and spaced apart that it looks as though there are ten petals. 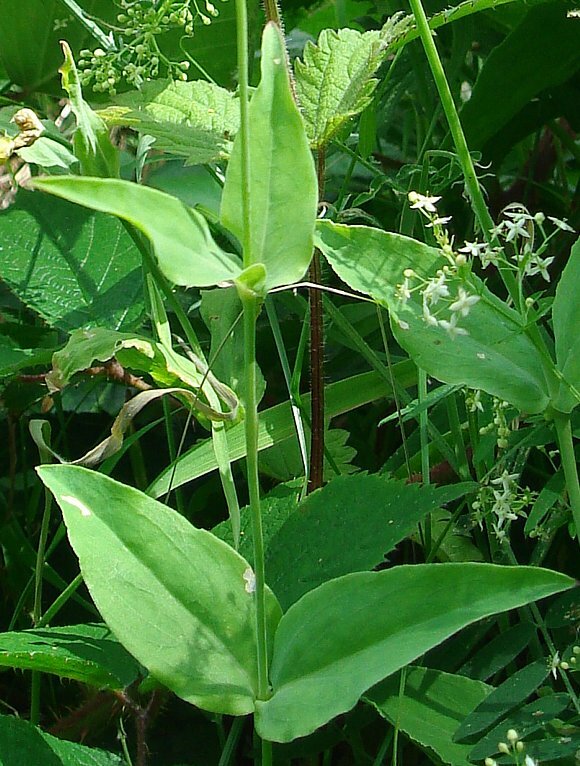 In White Campion, which also has five deeply cleft petals, the surrounding outer calyx is greenish rather than pinkish mauve or yellowish. 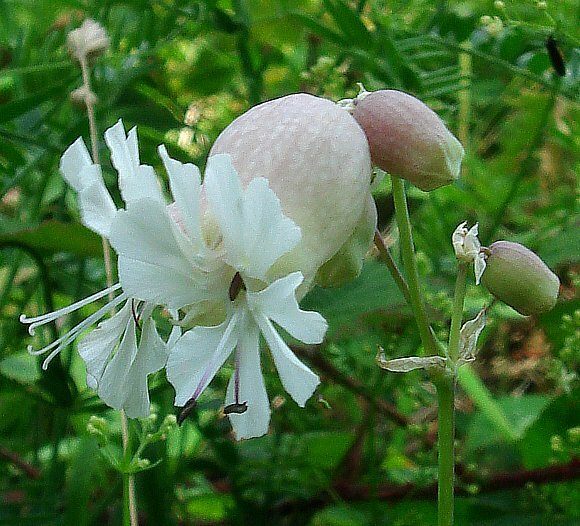 The calyx of Bladder Campion does not curl outwards at the ends as do those of White Campion. 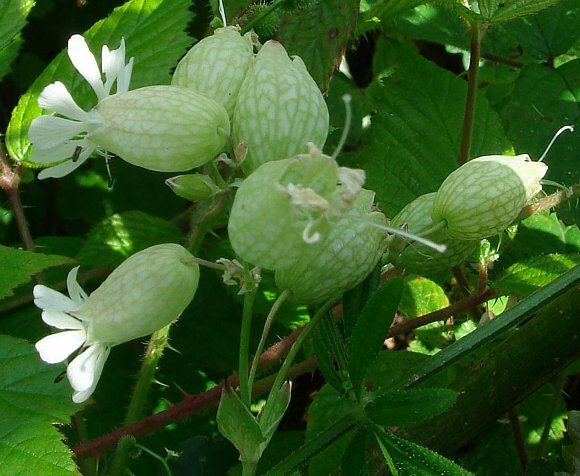 Bladder Campion is tolerant of soils polluted by heavy metals and is a hyperaccumulator of zinc. It is thus a valuable metallophyte for the phytoremediation of contaminated land able to mop up zinc, for instance from old mine spoil tips or from sheet metal galvanising factories. Note that to remove the metal entirely, the plant then has to be harvested and disposed of safely elsewhere. The whole cycle has to be repeated over several seasons to bring heavy metal contamination down to safe levels. See Thrift for more information re sequestering of heavy metals. Bladder Campion smells of cloves, but only at dusk - the flowers remaining open throughout day and night. The flowers waft a clove-like fragrance into the air in the evening. Eugenol is the principal ingredient of clove oil which is present not only in cloves but also nutmeg and cinnamon. Clove oil is used to flavour cold drinks (clove cordial), as a local anaesthetic in dentistry and in perfumes. Whole cloves are used in apple pies and in Indonesian kretek cigarettes. Eugenol attracts male orchid bees. Eugenol is also present in Artemisia (Wormwoods), Japanese Rose , Water Avens and Hybrid Geum. It is moderately toxic and is a phenyl propanoid related to Safrole, Myristicin, Estragole, Apiole, asarole and elemicin .